This Las Vegas wedding inspiration doesn’t have Elvis, a drive-thru or a small chapel. 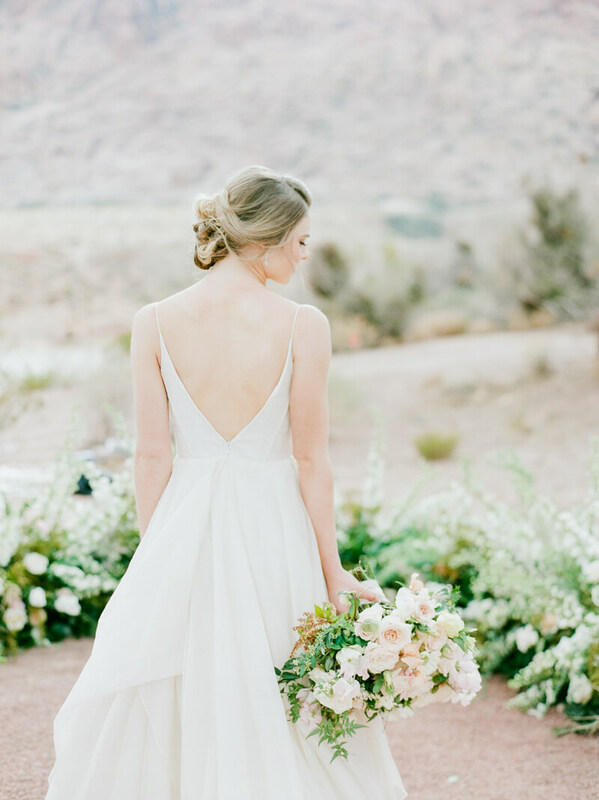 But a graceful bride and her handsome groom completely steal the show, thanks to the creative contrast of soft silhouettes and the desert landscape. In classic and elegant wedding style, this shoot gives us a unique glimpse into a wholly different side of this popular tourist destination. Sophistication abounds through the invitation suite. Set up with a silver tray and roses, this collection features traditional wedding colors, an ornate monogram and elegant script. It’s the accents like nametags, a blush velvet ring box and calligraphy that bring this shoot to life. The blonde-haired bride clutches a loose bouquet of blush roses and assorted greenery that echo the wild, unfettered scenery. The train of her A-line gown flutters in the wind. And as she turns away from the camera, one can see the open back of her gown. Just like the bride, the groom’s accessories are important, too. A striped tie, cuff links and a compass accompany his look of a gray suit and modest boutonniere. The bride and groom embrace among the sparse grasses and rocky terrain, where they exhibit joy and soft smiles. And in a show of emotion, the groom gently touches his bride’s face as the wind brushes against her hair. The bride also shows off her best accessory—a stunning oval-shaped halo ring—alongside the simple neckline of her gown. When the photographer steps back, they capture the entire length of the bride’s train, creating an image of elegance in the untamed landscape. The contrast of the couple’s soft appearance against the harsh lines of the mountains and cacti create a unique vision. But they are seen in a beautiful last shot surrounded by a half-circle of plush floral arrangements, which introduces a refreshing dose of color into the location. 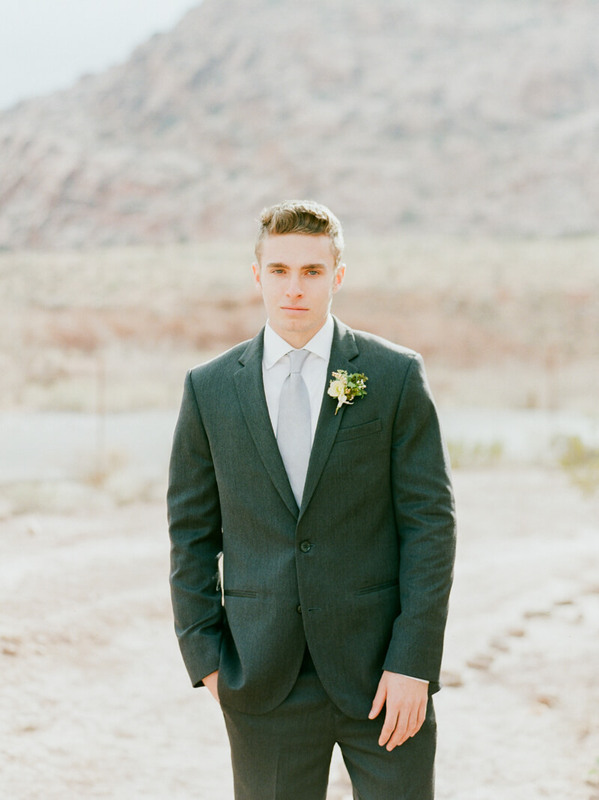 Las Vegas is synonymous with nightlife, bright lights and celebrity but this styled shoot brings all of that down and elevates the beautiful desert landscape. 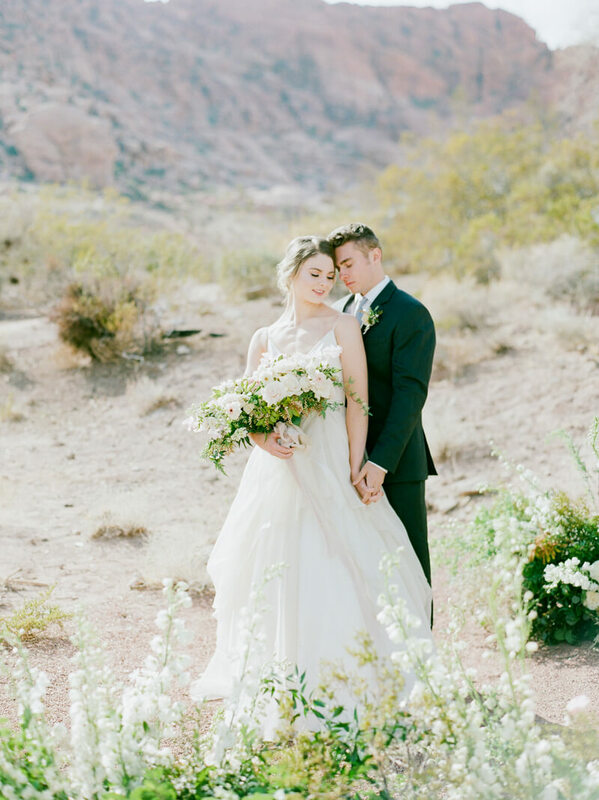 Paired with an elegant couple and lush florals, this styled shoot re-imagines Las Vegas weddings, proving you can create a whole new world of timeless style no matter where you are.